Since I’ve been spending a lot of my spare time bird watching, I’ve slipped into cooking so many “ridiculously easy” recipes that I’ve decided to make Ridiculously Easy a permanent feature on the blog. Through the magic of blogging, I’ve gone back in time to add a tag to many of the recipes that fit into this category, dishes that take just a few minutes or that allow you to dump your ingredients into a pot and let them cook a short time while you’re free to do other things. Just click on the tag to see the first few recipes that I’ve categorized as Ridiculously Easy, or R.E for short. Today’s easy recipe turned out to be so delicious and comforting that I can see it becoming a regular meal at my house. Like my last R.E. 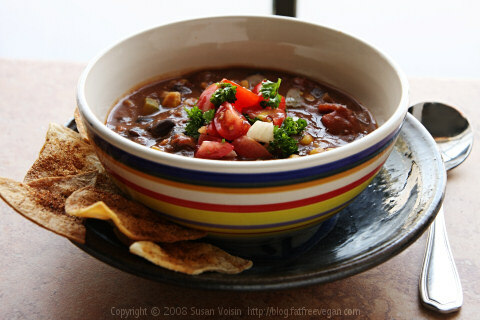 recipe, it uses refried beans (though I assure you that not all my ridiculous recipes do!) I know that some people turn their noses up at canned refried beans, and though I agree that freshly made taste better, the canned version is such a great convenience. In this soup, they contribute a wonderful creamy mouth-feel that will make you think the soup is richer than it is. But if you don’t like using canned refried beans, you can always do it the old fashioned way: whiz up a cup and a half of pinto beans in your food processor with a little of their liquid and add them straight to the soup. No frying needed! For those of you following Weight Watchers Freestyle, this Soup has zero points. Check out more of my zero point recipes. This soup is so thick it’s almost a chili. Use the minimum amounts of chipotle chili powder and hot sauce to make this a mild dish or add more to make it as hot as you dare. Heat a large, non-stick pot and sauté the onion until it begins to brown. Add the garlic and bell pepper and cook for one more minute. Add all the remaining ingredients and cook until the flavors blend, 20-30 minutes. Serving suggestion: Garnish with fresh tomato salsa and serve with baked tortilla chips and a large salad. One serving is zero points on Weight Watchers Freestyle program. Thanks to everyone who emailed and left comments identifying my mystery birds. The robins and cedar waxwings are still hanging around, even after last night’s storms. I’ve discovered that they’ve finished the hackberries and are now eating our holly berries, so I’m hoping there’s enough food for them to stick around a while. Please spread the word about this recipe by pinning or sharing it! Previous Post: « Robins: Harbingers of Spring or Winged Nuisances? On the stove as we speak. I used Spanish Smoked Paprika. Cannot wait to try it. Great recipe. I made it yesterday and changed it up a little. 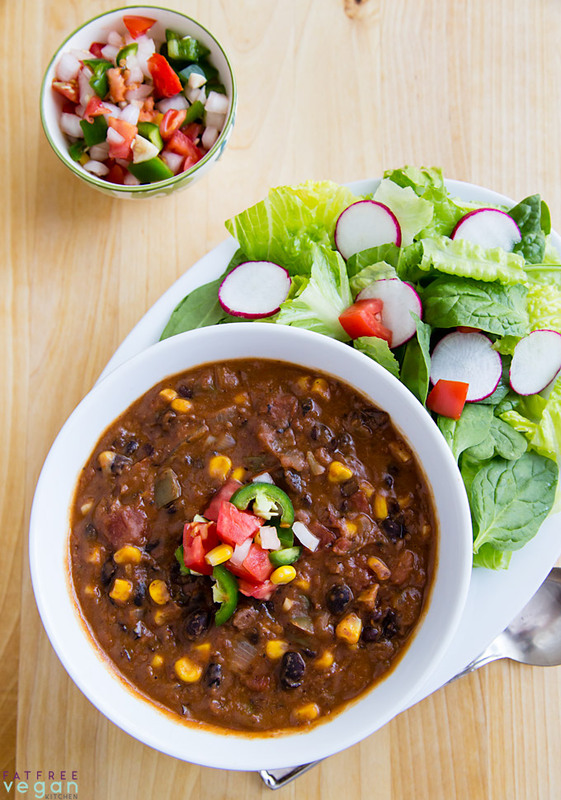 For our family, we like it even better… just change out the green bell pepper for a poblano pepper! Also we leave out the paprika, hot sauce, oregano, salt & pepper. It is a go to recipe for sure. I just made this before the kids get home from school. Going to hold the temperature in a crock pot until dinner time. I’m always looking for ways to cook up leftovers. We had leftover refried beans and spanish rice from a restaurant, so I added the beans and I’ll toss the cooked rice into the pot 30 minutes before serving. It smells awesome! I realize that restaurant refried beans aren’t always vegan, but we aren’t a strict vegan/vegetarian household. Thanks for the recipe! I made this recipe for the first time a year ago. I made my own re-fried beans and prepared my own black beans from dried instead of using canned. I have since made this recipe several times and plan on making it again today. It has a nice well rounded flavor and holds up well when frozen. In fact, it’s fantastic to make a double or even triple batch of, then portion it out and freeze to have as easy meals throughout the fall and winter. This was so delicious and flavorful. I used a fresh hot chili pepper – one of the long skinny kinds – gave it great kick. I added a bit more corn. I want to eat the entire pot myself. Mine came out more like a stew and I am enjoying it that way. What a treat – thank you!!! This is delicious! I made it according to the recipe, and loved the texture and flavor. Finally tried this soup. Sending my daughter off to new, tiny apartment in DC so wanted to practice some ridiculously easy recipes she can use. And as someone posted above, this is ridiculously AWESOME! Seriously licking-the-bowl rich and delicious. I ended up making my own refries and by time to add to soup had made a pretty good dent, so used immersion blender just slightly. Only change: added some canned green chilies. This will be a staple, and probably our new New Year’s soup. Thank you so very much for all the great recipes and keeping it real in the kitchen! I was having a massive craving for bean soup this morning. So I made this recipe for the first time and had a big bowl of it for breakfast lol. I topped it with some avocado chunks and lime juice. It was insanely good! Thank you Susan!! 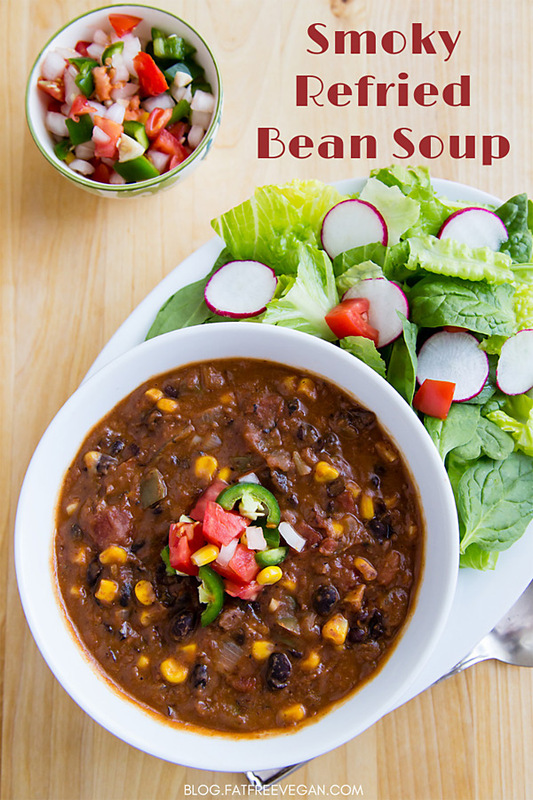 This soup is incredibly fast even without canned beans. Although I love my IP, I recently hauled out my old Creuset and have been slow cooking beans in the oven and on the stove top. 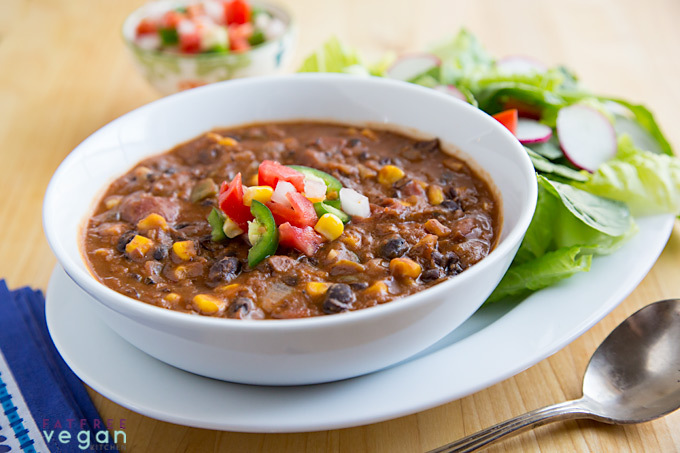 I’ve fallen in love with the creamy texture of pinto beans cooked this way. I used a bean masher to smash up the beans before adding to the soup. An immersion blender would have been a great way to do this too. Pretty sure this will be a staple in my house. 🙂 I chopped up some onions and a jalapeno to put on top and baked some corn tortillas to crumble over it. One of these days I want to do a “Ridiculously Easy” challenge and make one of your RE recipes every day. I’m pretty sure I could live on them exclusively! Made this yummy soup his morning. Since I rarely follow a recipe verbatim, I added Bay leaves, basil, a pinch,of sugar, 2 cups of veggie broth , celery, a squeeze of lemon juice , chilli seasoning, a small red pepper in addition to the green one and cilantro at the end. It was quick, easy and a do again! I make this one all the time. One of my favorites!! Just made this for dinner… Hubby has given it two thumbs up three times already and he’s only just started! Thank you for the recipe! 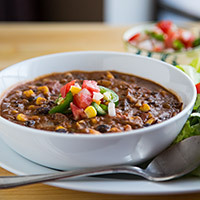 Your Smokey Refried Bean Soup was ‘ just out of this world ‘. Thank you so much for helping me on my Vegan journey. 😊💗👍Best wishes from Deborah in Christchurch. New Zealand. This is one of my favourite soups of all time! Just googled it so I can make it this week! YUM! I love this recipe and stopped by to copy the ingredients for my grocery list. I wanted to let you know that there are ads for bacon on your site! Another great recipe! This made 5 hearty servings. I added an extra can of tomatoes, some cayenne pepper, and the juice of a lime. I’m not vegan so added a bit of cheese on top. Winner!